An Engraved Stag Hunter crafted by Australia, Peter De Raso. 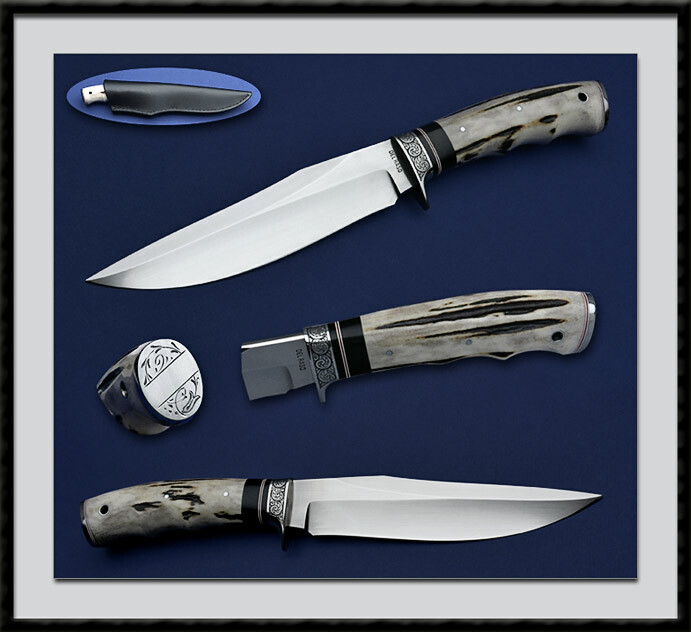 BL = 6 3/4", OAL = 11 3/4", Double Hollow ground ATS-34 @59RC, Hand rubbed Satin Finish blade with a Rounded spine and Distal Taper, unsharpened Clip, Engraved Stainless Guard, 2x SS Pins accent a Stag Handle with Finger Grooves and a SS line Lanyard hole, Engraving by Fellow Aussie Phil Vinnecombe. Fit and Finish is of the Highest Quality. Comes with the custom sheath pictured. Condition is Pristine.